Black Ice Software - Print2Email version 10.07 is released! Print2Email version 10.07 is released! Share contacts on the computer for all users with the addition of the Global Address Book! Black Ice Software has released version 10.07 of the Print2Email. This version allows Administrators to share their contacts for All Users on the computer, with the new Global Address Book feature. 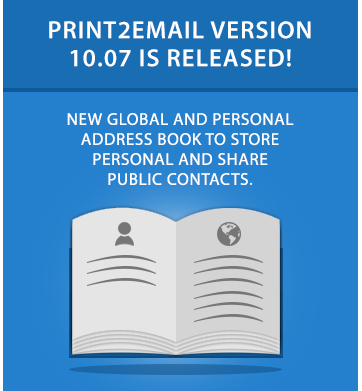 The latest release of Print2Email version 10.07 also includes a Personal Address Book. The Person Address Book allows each user to create or download their personal/private contacts from Gmail, Yahoo, and Outlook into the address book without allowing other users to see the saved contacts. The new Address Book improvements result in more efficient use of the email sending capabilities in Print2Email, with more options to store and share personal/private and public contacts on the computer. The latest Print2Email also includes stability improvements, such as printing documents with unicode names, registering the Print2Email if the demo period is expired and more!